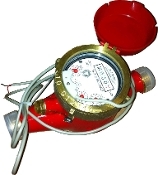 5/8x3/4" No Lead Hot Water Meter with 3/4" Male NPT Couplings. Ideal for 1/4 - 20 GPM flow rates on 3/4" water lines. Has 1 Gallon Pulse Output. Can be interfaced with an LCD remote.